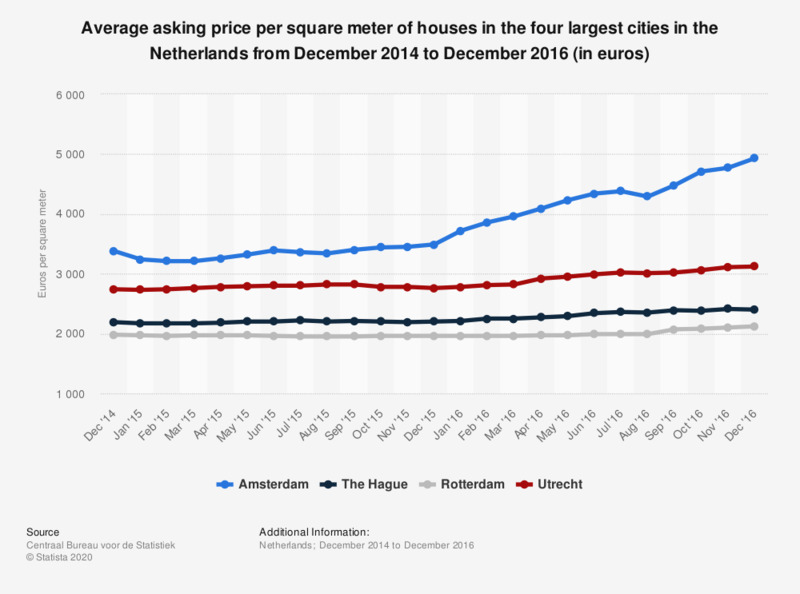 This statistic shows the average asking price per square meter of houses in the four largest cities in the Netherlands from December 2014 to December 2016 (in euros). In December 2016, a house in Utrecht would cost approximately 3,120 euros per square meter. The European housing, or residential real estate, market has recently shown clear signs of recovery, with an increasing house price being the main trend. In recent years, the housing market has continued to rise in the Netherlands due to low mortgage rates, a recovering economy and a high level of consumer confidence. For example, the average selling price of houses was higher in 2016 than in 2013, when prices reached a low point. In 2017, real estate prices are expected to increase with seven percent as a high number of sales, combined with an increasingly scarce supply, are expected to push the housing price up. In the four largest municipalities, the demand of housing outweighs the supply. In December 2016, the average number of houses for sale in the municipality of Amsterdam was approximately 1,800 with this number reaching an average of 4,300 in December 2014. The source states that the avarage asking price concerns existing real estate, being offered on the Internet at the end of the month. The numbers are rounded to ten euros.